You can find plants anywhere, lots of stores carry them. The Family Tree Garden Center takes pride in painstakingly hand choosing only the highest quality plants and products. We are proud of our quality and the wide variety of traditional and unique annuals, perennials, trees, and shrubs. Fresh and healthy is of utmost importance to us and we are happy to be able to pass that along to our customers. We buy from many locally owned nurseries throughout Georgia, as well as from states across the country, including California, Oregon, Florida, Alabama, and Tennessee. Our Horticulturist and Georgia Certified Plant Professionals are available to assist you in choosing the right plants for your garden, container or landscape. We are always excited to see what’s new each week and can’t wait to pass it along to you! Annuals – an annual is a plant that grows for one growing season. Annuals are desirable because they bloom for the entire season. Fresh annuals arrive each week. Varieties vary so check often to see what’s new! Perennials – Perennials are planted once and will return each year bigger and better. Perennials traditionally require less care, and some even thrive on neglect. The blooming time is generally a few weeks so gardens should be full of perennials that bloom at different times during the seasons. 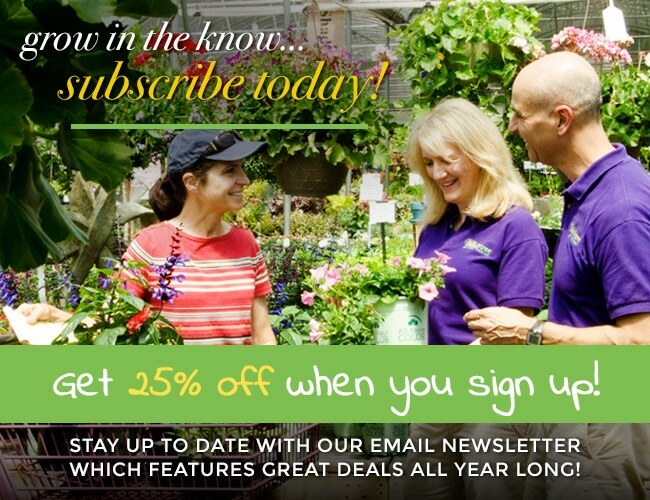 Consult one of our sales assistants for information on blooming times. We are proud of the extensive collection of perennials that we carry. New quality perennials arrive each week. Trees, Shrubs, Vines – Our trees, shrubs, and vines are top quality from growers. Our trees, shrubs, and vines are hand selected so that we can be sure to pass quality along to you.